The El Macayo dam on the border of Tabasco and Chiapas states in southern Mexico was officially inaugurated last month. 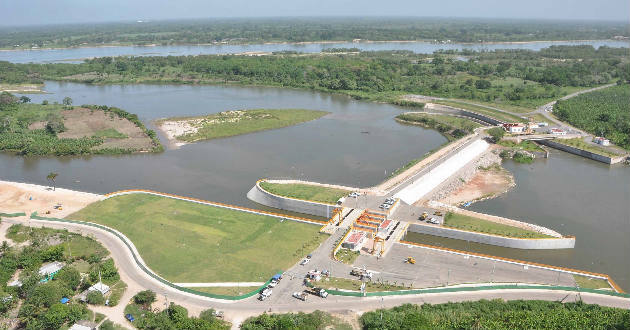 The 90-million-dollar dam, which has been under construction for a decade, is designed to regulate flow along the River Grijalva (aka Mexcalapa and Carrizal) that flows through the city of Villahermosa in Tabasco. The city and surrounding settlements have suffered severe flooding many times in recent years, and the El Macayo dam should bring some much-needed relief to around 700,000 people who live in the areas of greatest risk..
Why does the state of Tabasco have a high risk of floods? The Grijalva–Usumacinta river system is one of the world’s largest in terms of volume. It is easily the river system with the greatest flow in Mexico. It is essentially a double river, with two branches of similar length which both start in Guatemala. Each branch flows about 750 km (465 mi) through Chiapas before they unite in Tabasco about 25 km from the Gulf of Mexico. Each of the two branches has a flow of about 14% of Mexico’s total. The flow of the combined Grijalva–Usumacinta River is about twice that of the Missouri River in the USA. The state of Tabasco itself receives an average rainfall three times higher than Mexico’s national average rainfall, and accounts for 38% of the country’s freshwater. Given these conditions, it is not surprising that the state of Tabasco is one of the most vulnerable states for flooding in Mexico. The UN’s Economic Commission for Latin America and the Caribbean has estimated that the state suffered around $4.5 billion in losses from flooding between 2007 and 2011. The dam is only one small component in an Integrated Hydrology Plan that is has been designed by the National Water Commission, Conagua. The agency has been assigned more than $110 million this year to complete existing hydrology-related infrastructure projects and update flood protection plans. The previous government spent $640 million to begin a flood management program for the state; this included building flood prevention infrastructure, dredging the major rivers and constructing flood-alleviation channels. Arturo Núñez, governor of Tabasco state, says that the state’s flood management program should include the relocation of residents currently living in the most vulnerable areas, as well as reforestation of the drainage basins, continued regular dredging of the main rivers, and a reorganization of irrigation systems. International media have been focusing attention in recent weeks on massive floods in Pakistan and China. While not on the same scale as the tragedy unfolding in Pakistan, Mexico is dealing with the aftermath of its own very serious flooding in the southern part of the country. Weeks of torrential downpours, with rainfall in many areas reaching more than double the yearly average, have led to widespread inundations. The worst flooding has been in the lowland Gulf Coast states of Veracruz and Tabasco, where the channels of major rivers have been unable to cope with the volumes of water fed into them by their network of tributaries. These tributaries begin in the mountainous areas upstream, which received the heaviest rainfalls, in the states of Chiapas and Oaxaca, which are also experiencing serious flooding. According to the Associated Press and Mexico City daily Milenio, over 300,000 people are directly affected, and tens of thousands have been forced from their homes. The Papaloapan River has burst its banks and caused record flooding in parts of Oaxaca and Veracruz. Some of the worst flooding has been in Tlacotalpan, a UNESCO World Heritage Site in a low marshy area about ten kilometers from the Gulf of Mexico, between Veracruz City and Coatzacoalcos. President Felipe Calderon personally assessed the damage and expressed solidarity with the flood victims by wading a kilometer through the flooded streets of Tlacotalpan. He ordered six hundred Mexican sailors into the flooded areas to help local residents. The low-lying state of Tabasco has been hit the hardest. The homes of over 120,000 people are flooded and over 180,000 hectares belonging to 20,000 people have been lost. This region has repeatedly suffered serious flooding in recent years; a controversial plan for flood protection in this area has never been completed. 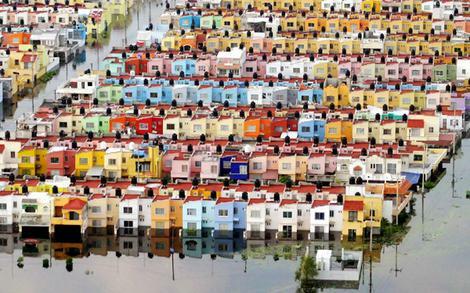 Villahermosa, the capital of Tabasco, has been flooded once again. It suffered catastrophic floods in November 2007 and November 2009. The recent Villahermosa flooding is exacerbated by the controlled releases of water from the massive Malpaso and La Angostura dams in the upper reaches of the Rio Grijalva basin. The dams are essentially filled to capacity; with more rains expected in the next two months, water must be released to provide spare capacity to avoid even greater flooding in the wettest fall months. The same situation is occurring with the dams in the Papaloapan basin. Rivers, floods and water-related issues are discussed in chapters 6 and 7 of Geo-Mexico: the geography and dynamics of modern Mexico. Ask your library to buy a copy of this handy reference guide to all aspects of Mexico’s geography today! Better yet, order your own copy. The small, oil-rich state of Tabasco, one of Mexico’s wettest states, is regularly subjected to serious flooding. Much of the state is a wide coastal plain of sediments brought by rivers from the mountains of Chiapas and Guatemala. Two major rivers—the Grijalva and the Usumacinta—converge in the Pantanos de Centla wetlands. These rivers have meandering, braided channels and highly variable flows, partly because of hydropower dams far upstream. The state’s high incidence of floods has been exacerbated by subsidence and deforestation due to oil and gas extraction which has led to excessive silting of river channels. Looking to the future, rising sea levels will only increase this area’s vulnerability to flooding. 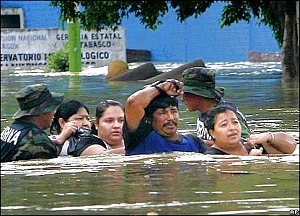 Several days of heavy rainfall due to a low pressure system led in late October and early November 2007 to massive floods, called at the time by President Felipe Calderón “one of the worst natural disasters in the history of the country.” About 80% of Tabasco was under water at one point. Tabasco produces 80% of Mexico’s total cacao and 40% of its bananas; the losses of farm harvests alone were estimated at $480 million. The floods disrupted the lives of more than a million residents, and 20,000 people were forced to seek emergency shelter. The state capital Villahermosa, located near the junction of three branches of the Grijalva River, was particularly badly hit. It has been claimed that the 2007 floods would have been much less serious if funds allocated for hydrologic infrastructure improvements had not been misappropriated. A new Tabasco Hydrological Plan was announced in 2008. The $850 million plan should ensure the integrated management of six river basins and major improvements to the systems for storm tracking, weather forecasting and disaster prediction. Several rivers will be dredged and the coast will be reinforced with breakwaters and sea walls. Unfortunately, the plan could not be implemented in time to prevent serious damages from the next big Tabasco flood in early November 2009 which inundated the homes of more than 200,000 people. Now, we learn from The OOSKA News Weekly Water Report for Latin America and the Caribbean (28 July 2010) that state politicians are considering a lawsuit against the National Water Authority for failure to competently oversee all the various contracts involved in the 2008 Hydrological Plan. A local newspaper in Tabasco state reports that 10 companies failed to deliver the dredging and flood protection works they had been contracted to do, and so far, the National Water Commission has failed to collect fines of about 770,000 dollars for non-compliance, as stipulated in their contracts. The original contracts were valued at 6.7 million dollars, and were apparently paid in advance. All work was scheduled to have been completed by March of 2009. Federal politicians are now claiming that the National Water Authority’s failures led directly to further serious flood damage in late 2009, which would have been avoided if the work had been completed on time. According to a Mexico City daily, Tabasco’s 2008 Hydrological Plan is still only approximately 50% complete, as of July 2010. NEW (Sunday 11 July): At present the discharge of the Río Bravo/Grande is decreasing, but a secondary peak discharge is expected to sweep downstream from late Monday through Tuesday, depending on the precise location. The following summary of recent developments related to Hurricane Alex has been compiled from a variety of news reports. In Coahuila, memorial services have been held for Horacio del Bosque Dávila, the state’s Director of Public Works, who died alongside seven colleagues while assessing the flood damage from the air, when their light plane crashed. Four more deaths from drowning have been reported, with the discovery of four bodies on the bank of the Río Bravo near Ciudad Acuña. A state of emergency has been declared in many more municipalities, bringing the total number of affected municipalities to 43 in the state of Nuevo León and 25 in Coahuila. Nuevo León: Agualeguas, Galeana, Doctor González, García, Marín, General Zuazua, Mina, Hidalgo, Iturbide, Los Herreras, Parás and Pesquería. Coahuila: Los Acuña, Allende, Cuatrociénegas, Guerrero, Hidalgo, Jiménez, Juárez, Morelos, Múzquiz, Nava, Piedras Negras, Progreso, Sabinas, San Juan de Sabinas, Villa Unión and Zaragoza. Both main highways between Monterrey and Nuevo Laredo are currently closed, and expected to remain so for another 3-4 days. Federal highway 85D is flooded between km 143 and 146, near Sabinas Hidalgo, due to the Río Salado overflowing its banks. Highway 85 (the non-toll highway) is closed at km 155, near Ciénega de Flores, because of a badly damaged bridge. Cross border rail services were also suspended for a time. International Bridge #1 was closed for more than 24 hours as the Río Bravo peaked, but has now reopened. Not surprisingly, truck traffic across the international bridges into Nuevo Laredo has been severely affected, especially since they currently have no way to proceed further south. The vehicle inspection offices on the Mexican side of the bridge were flooded. Several roads in and around the city of Monterrey have been closed due to flooding and resulting landslides. In Tamaulipas, 41,700 people have been forced out of their homes, in 19 municipalities. In Hidalgo municipality, work has begun on erecting an emergency bridge to reconnect 14 small settlements to the rest of the state following the destruction of the old bridge. The settlements include El Chorito, one of the most revered pilgrimage centers in north-eastern Mexico. The flow levels on the Río Bravo/Grande are unprecedented in recent times. All floodgates at the Venustiano Carranza dam have had to be opened, and are expected to remain so for 4 or 5 more days. The Río Bravo has not experienced flows like this since the construction in 1968 of Presa La Amistad. The river peaked at a height of 13 meters, more than 12 meters above its normal level for this time of year. Its peak discharge was 7,500 cubic meters per second, also a post-dam record. A total of up to 300,000 hectares of agricultural land have been affected by flooding. Tamaulipas has applied for emergency farming aid for an area of 153,500 hectares in 32 municipalities. The most valuable crops to be affected are sorghum, corn, cotton, chile, tomato, alfalfa and canteloupe. Sorghum production alone is likely to fall by one million tons. The cost of the repairs needed for the badly damaged potable water network in the city of Monterrey (Nuevo León) is estimated at 260 million dollars. The hurricane has damaged more than 1,000 schools in Nuevo León, out of a total of 3,535. At least 60 schools suffered severe structural damage. The estimated repair costs are about 30 million dollars. This YouTube video is a collection of photos showing the extraordinary amount of damage done in the city of Monterrey. The loss of life and property damages might have been much greater had it not been for efficient emergency services and disaster response. Aid is reaching almost all the victims of the floods, either via the Red Cross or via Mexico’s Armed Services (Army and Navy). Hundreds of additional firemen, rescue crews and police have been drafted in to help. A shelter for more than 800 people is operational in the city of Matamoros. A vaccination campaign is already underway, with measures being taken to prevent an outbreak of dengue fever. Telmex (Teléfonos de México) and other phone companies are giving residents in areas affected by flooding up to a week of free local and national long distance calls. Two undocumented Central American migrants were rescued from the river after having been swept more than 5 kilometers downstream. They had tried to cross the river using an inner tube. It had taken one of them two months to reach this border crossing from his home in Honduras. A rescue helicopter plucked 8 people to safety from the steel tower supporting the community water tank in El Camarón, located between Nuevo Laredo and Cd. Anahuac. They had been marooned when the River Salado overflowed. Local officials believe another five people may also have been trapped, but have so far failed to locate them. Mexico’s climatic hazards, including hurricanes, are analyzed in chapter 4 of Geo-Mexico: the geography and dynamics of modern Mexico. Buy your copy today, so you have a handy guide to the “back story” behind Mexico’s current affairs. The Mexico-USA border area may be in for a very wet week, since Tropical Depression 2 (which would become Hurricane Bonnie if its wind speeds increase) is now approaching the area from the Gulf of Mexico. Weather Underground has more details and maps showing the possible storm paths. The Río Bravo (Grande) is expected to peak in Laredo at 13 meters (42 feet) at Bridge 1, and possibly even higher at the Columbia bridge. Cross-border travelers in that area are best advised to delay their travel until the river level is well on its way down. Otherwise, anticipate long delays and time-consuming diversions. State officials in Coahuila now say that at least 80,000 people in that state are homeless, 20,000 homes are uninhabitable, and 40,000 homes are still without drinking water. The Nuevo León state chapter of the National Chamber of Housing Developers claims that at least 7,000 homes in Nuevo León need major repairs or rebuilding as a result of Hurricane Alex. This YouTube video of the flood gives a good idea of the power of the water flow in the city of Monterrey (Nuevo León).